Oh, how I was looking forward to having tailor made clothes! I had come to India under the assumption that I would go home in a couple of years with a closet full of well-fitted clothes in exotic luxurious fabrics: Madras silk, Bengali cottons… That’s what they wrote in every book for expats, and I believed them. Once again, I was mistaken! In South India, women seem to have three choices as to what to wear: western wear, the sari, and the shalwar kameez. The shalwar is a kind of loose pants that comes in different shapes, and the kameez is the long tunic. 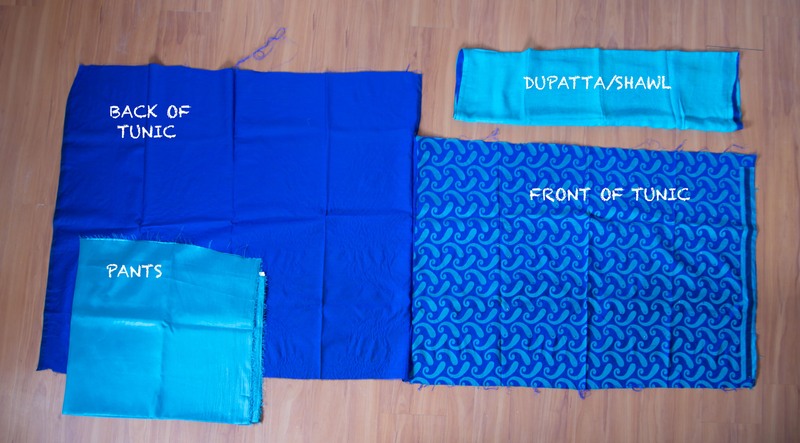 It’s always worn with a dupatta, or scarf, worn with the ends on the back. That’s what I usually wear when I am outside, mainly because it’s comfy. Dress material as it is called, comes with four pieces. Sometimes the front and back are the same. And one: Because I am smart, I started small. I bought some cheap fabric at the local equivalent of Walmart and called a tailor recommended in the book of the stupid women’s club I belong to. The lady was very nice and owns a little tailor factory close by. I went to her apartment, wearing the tunic I wanted her to replicate exactly. No problem Madam. She measured me every which way and I handed her the fabric. After three weeks, I called complaining about the delay since the usual turnaround for a full tunic and pant set should be a 3-4 days. Guess what? It doesn’t fit. It’s a tent. It’s literally 4 inches too big on each side. Thought I wasn’t pleased, I didn’t complain, because I like the blue fabric (see above picture), it’s a loose tunic, and perfect for steamy hot weather. I wore it a lot in Kochi. And two: Time to find a new tailor. I casually asked neighbors but still no one volunteered a name. Tailors are like family recipes back in the States: they are well guarded, and given only to well deserving friends. I guess I am not deserving yet! Close to home, on Varthur road, I saw a little boutique that looked cute and inviting, with a nice old lady owner to boost. Same thing: I brought cheap pink fabric and got measured all over. But I had a feeling right away something would go wrong. She kept pulling her tape measurer over my chest. I kept inhaling deeply. She kept squishing my breast (this not the first time this happens, check this older post). No worry Madam. Then she measured my calves in the wrong spot. Not to fall on stereotypes, but Indian women are shaped differently: they often have calves much skinnier than ours, and the bulge of the muscle is higher, closer to the knee. I knew she was getting it too tight, I just knew it. No worry Madam (when will I ever learn?). I stated I didn’t want it lined. I wanted that particular top to wear while teaching, and it needed to be as light and cool as possible. I strongly insisted I didn’t want a lining. A week later, no surprise, I get my suit, it’s too small, and of course it’s lined. She loosened the top within 24 hours but I had the pants taken out at the mini tailor across the street. For the fun story, he took the pants in instead of out, but that was an honest mistake, and he profusely apologized about it and only charged me half price. And three: This time I went all out. I bought the fabric at a nice store, an expensive store on Commercial Street and had the suits made there. I paid quite a bit for a flowing, flowery cotton fabric that I fell in love with. In a book they showed me, I chose a pattern that would easily be converted as a summer dress when back in the U.S. A tailor came from the third floor to measure me and we discussed necklines, piping, lining, and length and pant shapes. I left giddy! A week later, I got yet another tent. No shape whatsoever. And too small a tent to boost. The flowy fabric is lined with heavy linen, which completely ruins the look. He fixed the width of the tunics within an hour, leaving a visible seam mark on each side, but I still have to take the pants across the street. The piping however is exquisite, that man certainly is a good tailor for someone other than myself. I have been told I need to be more assertive. I tried but I can’t do much more. I just pout and leave, swear to myself never to come back, tell all my friends about my bad experiences, and go give my money to someone else. You ask me how I want it. I tell you how I want it. You know how to do it. Yet you don’t do it. I don’t get it. Aside | This entry was posted in Adapting, Frustration and tagged Bangalore, Commercial Street, expat, fabric, India, sari, sewing, sewing machine, shalwar kameez, tailor, Whitefield. Bookmark the permalink.